The Solomon Islands’ ocean is worth billions of dollars every year. Over two and a half billion dollars according to a report launched on 27th July 2017. This matches the value of 1/3 of Solomon Islands’ Gross Domestic Product (GDP). It’s a lot! Some of these values we see in the marketplace, for example, tourism brings in over $119 million per year and tuna taken from the Solomon Islands’ waters is worth over $1.6 billion. More importantly, much of the value is “hidden”; it is NOT revealed in the market system. For example, many people in the Solomon Islands rely on marine resources that they harvest for food – this is valued at more than $442 million per year. Imagine if those resources were lost and if we would need to replace that food somehow? The Solomon Islands’ marine ecosystems hosts one of the world’s largest tuna fisheries and a finite marine resource. The tuna fishery alone is valued at 1.66 billion a year. Other hidden values, also not revealed in normal market transactions, include the value of marine ecosystems in coastal protection. For the Solomon Islands, our coastal ecosystem provide over $48 million in value per year by protecting coastal communities and infrastructure from storms and cyclone damage; not that they prevent the damage – but can reduce the damage that would otherwise occur. A detailed report assessing these values has been provided to the Government of the Solomon Islands. The research was undertaken in collaboration between researchers and government partners. In support of the launched Report, Director for the Environment and Conservation Division, Mr Joe Horokou, remarked that ‘our marine ecosystems are truly valuable, providing vast benefits for our people, therefore, recognising the value of its resources will prevent their un-necessary loss and enable Government and stakeholders to plan and manage these resources more sustainably’. He further added “We need to know and appreciate the importance of the ‘marine environment’ for our wellbeing and development. These marine resources are ‘finite’ and thus needs to be ‘sustainably managed’. Dr Leanne Fernandes, Senior Project Advisor, MACBIO, presented the final report on the marine ecosystem service valuation for the Solomon Islands to Supervising Permanent Secretary on 27 July 2017. 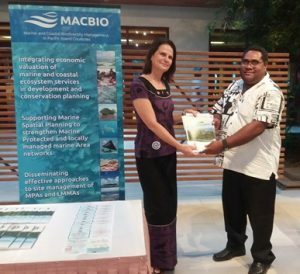 The Supervising Permanent Secretary thanked the MACBIO project for partnering with the Government to produce this report and noted how important it will be to protect the entire range of goods and services that the marine environment of the Solomon Islands provides to her people. The report was produced with the support of the Government of The Solomon Islands and the MACBIO project (funded by the IKI program of BMUB, implemented by GIZ with technical support from IUCN and in close collaboration with SPREP).